From the main roundabout which feeds traffic from Dublin, Newbridge and Naas town, and landmarked by the road art piece, known as The Globe, take the exit which is in the direction of Sallins. As you head to the next smaller roundabout, the Globe retail park, which contains Woodie's DIY superstore and Smyth's toystore, will be on your right hand side. At the roundabout take the left turn, and at the immediate crossroad, take the left turn, where you will find Petrie's cash and carry on you left hand side. Passing Joel Springs, and just before Naas oil and Dennison trailers, you will find on your lefthand side, the blue security gate entrance to Maudlin's Industrail Estate. 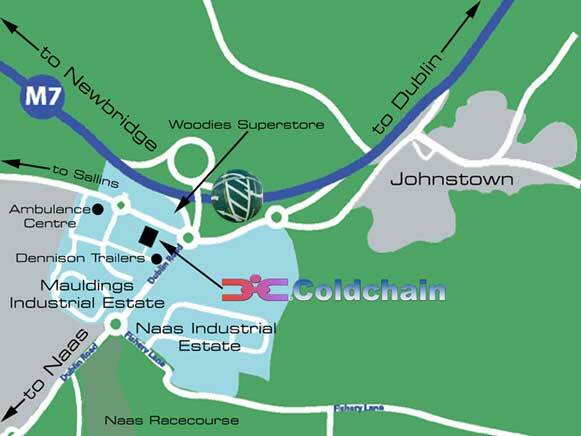 Coldchain Services will be facing you as you enter, and for office and production continue around to the end of the premises and turn right.